In New Zealand, there are many places to see glow worms and also many places to paddle a kayak. These two experiences, already lovely on their own, merge for a surreal adventure in Tauranga in North Island. My kayak glides into a dark and silent canyon filled with blue-green bioluminescence on an evening that pairs nature and action. My four-day tour of Napier and the Bay of Plenty on the northern coast of North Island is rich in such outdoor pleasures - and also art and myth. In the coastal city of Napier, I go on an Art Deco vintage car tour (www.artdeconapier.com), keen to learn about the style popular in 1920s Europe. It is characterised by precise and boldly delineated geometric shapes and strong colours, and used most notably in architecture. As it turns out, Napier did not have any Art Deco architecture originally, but an earthquake measuring 7.8 on the Richter scale devastated the town in 1931. The tragedy consumed all but a few buildings, so in a bold move two years later, the residents rebuilt Napier in Art Deco style. I meet my guide, Brocky, who is dressed in a jaunty Art Deco suit. The 1930s vintage car he is taking me around in is a dark blue Packard that comes with no air-conditioning and no power steering. Air New Zealand (www.airnewzealand.com) operates daily direct flights between Singapore and Auckland. 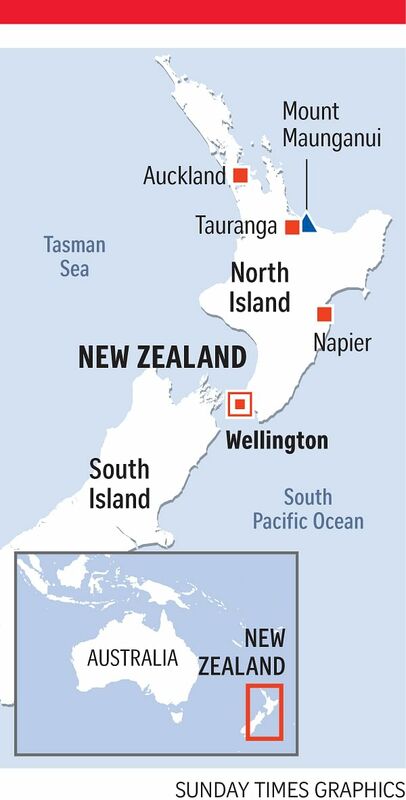 From Auckland, travellers can take a one-hour flight to Napier. The menu from the airline's premium economy class has a modern Kiwi twist and includes wines from New Zealand. • Familiarise yourself with simple Maori terms such as "kia ora", which means "be well/healthy" or simply "hi". It is also used as a farewell and an expression of thanks. Another common term is "Haere mai" or "welcome". • Try the Hokey Pokey ice cream that is unique to New Zealand. This vanilla ice cream with pieces of honeycomb toffee is perfect for anyone with a sweet tooth. • Don't forget to wear proper covered and comfortable shoes as New Zealand has plenty of options for outdoor activities such as hiking and cycling, and also more extreme sports such as bungee jumping and whitewater rafting. • The maritime climate in New Zealand is fairly comfortable, with mild summers and winters. In summer, the average temperature ranges between 20 and 30 deg C. In winter, it is between 10 and 15 deg C. But always bring along a jacket in case of weather changes. The 75-minute tour highlights multiple Art Deco buildings, many painted in pastels. Today, most of the major buildings have been restored or refurbished for new uses such as theatres, banks, hotels and restaurants, but the facades remain. Notably, these buildings use leadlight glass (also known as art glass) for their windows. Colours are used sparingly and the liveliness of the designs is achieved through the use of different textures of glass, instead of different colours. Brocky makes a stop at the former National Tobacco Company, reportedly the region's Art Deco masterpiece. This posh building is painted in beige and pink with a tinge of bronze details. An exquisitely designed arch is an arresting feature at the main entrance. The well-preserved building tells the story of how German tycoon Gerhard Husheer splurged on architecture at a time when all other buildings were comparatively economical. Taking an Art Deco tour here is a special lesson in art, history and architecture - all from the comfort of a 1930s car seat. For a country better known for extreme sports such as bungee jumping, whitewater rafting and skydiving, there are also many mild and flat cycling trails suitable for cyclists of all ages and fitness levels. The Takaro Trails cycling company (www.takarotrails.co.nz) has three different routes - Water Ride, Wineries Ride and Landscapes Ride. These are mostly off-road trails that showcase nature, wildlife and fruit plantations. For me, Takaro Trails recommends the 15km Landscapes Ride, which takes first-timers to New Zealand through luscious vineyards and coastal routes along Hawke's Bay, which is part of the Pacific Ocean. Cycling is an ideal way to exercise while relishing the serenity of New Zealand. At various stops, I take close-up photos of sheep and cows and watch the ocean waves. Unlike urban cycling in Singapore, cycling here is an escape to vast spaces. It is a slow and tough climb to the peak of Mauao. I am not equipped with hiking shoes and not prepared for a 30-minute ascent. But at the top, the sweeping view of the beach town of Mount Maunganui, Tauranga Harbour and the Pacific Ocean makes the effort totally worthwhile. Mauao is an extinct volcano 232m above sea level and positioned at the end of a peninsula. It is peaceful and I do not hear the waves crashing against the shore or the hustle and bustle of human traffic. And it is not just because I am on a mountaintop, it is also the sense of peace that the town of Mount Maunganui conveys and which is less likely to be discovered in busy Asian cities. I forget about the world for a moment because time stands still. A Maori legend has it that in the old days, there were three mountains - a female mountain, Puwhenua; a male mountain, Otanewainuku; and Mauao, also male. Mauao was in love with Puwhenua, but her heart already belonged to Otanewainuku. Mauao decided to end his life by drowning in the Pacific Ocean. Calling on the patupaiarehe - people with magical powers - Mauao asked them to tie a rope to him and pull him to the ocean. However, the patupaiarehe were people of the night and they fled when it was close to dawn, just when they took Mauao to the coast of the Pacific Ocean. The sun rose and Mauao was fixed in his place forever, hence his name, which means "caught by the morning sun". It is dusk and there is a slight autumn breeze when I start my kayak journey (www.glowwormkayaking.com) to another realm to see elves and fairies dance among the infinite lights of glow worms. They are located in the narrow, high-sided canyon at the top of Lake McLaren in Tauranga - I can already imagine the tranquil scene though my clumsy paddling makes loud splashes. I have not been on a kayak many times and my friendly guide, Tom, assures me that it is stable. Along the way, I learn that glow worms are insect larvae that glow through bioluminescence to attract their prey. They spin sticky webs, just like spiders, and emit a blue-green light. Fun fact: The hungrier the glow worms are, the brighter they shine. Tom explains that after about nine months, a glow worm turns into a pupa in a cocoon and emerges as an adult fly, which lives no longer than a few days because it has no digestive system and thus cannot eat. I focus on the ride into the unknown. Slowly, I catch a glimpse of the canyon after paddling for about 20 minutes. I see some glow worms now and, suddenly, I am surrounded by hundreds and thousands of blue-green lights as I get closer. Words do not do justice to how captivating these tiny specks of light are. They are no mythical creatures, but so enchanting that in the total darkness, I am hypnotised by their light, which is not overwhelmingly bright, but softly radiant. Another surprise awaits as I paddle out of the canyon. Myriad stars are on full display in the clear night sky. Millions and millions of stars. This fairy-tale place is out of this world - from the glow worms on land to the glowing stars in the sky. My time in Napier and the Bay of Plenty are days of freedom and my pace slows down enough for me to appreciate the art, the boundless nature and the stories of the destination. It becomes clearer to me that New Zealand's Maori name Aotearoa or "the land of the long white cloud" is perfect - it is a dreamy destination. • The writer was hosted by Air New Zealand and Tourism New Zealand.